The Newhouse Lighting commercial quality compact LED flood light produces 1373-lumens of 3000K light. Perfect for lighting building facades, billboards, address signs, driveways, yards and parking lots. 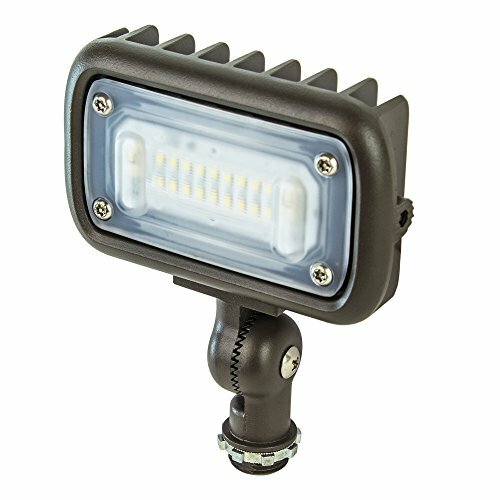 Mountable close up to illuminate a sign or wall or mountable up high to illuminate a yard or parking lot up to 75 ft. This durable fixture carries a no-hassle 5-year warranty. Ul listed, Ip66 rated and wet location rated. PLEASE NOTE: If you looking for a mounting post, please type "B07FK88B65" in the search bar. PLEASE NOTE: The 15-watt light (B07BB9NY87) is not dimmable, but the 30-watt light (B079PSLYX7) is dimmable. If you have any questions about this product by Newhouse Lighting, contact us by completing and submitting the form below. If you are looking for a specif part number, please include it with your message.